NIA CHARLESTOWN NEVIS (SEPTEMBER 19, 2016) – The following is an address delivered by Premier of Nevis Hon. 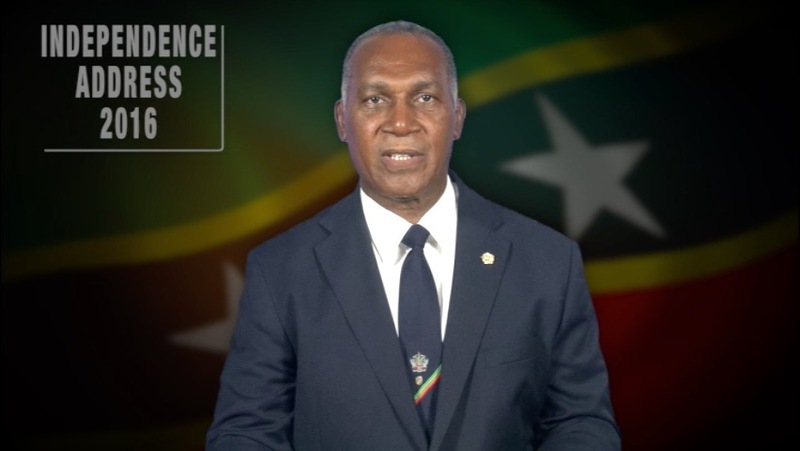 Vance Amory to mark the 33rd Anniversary of Independence of the Federation of St. Kitts and Nevis on September 19, 2016. It gives me great pleasure to bring you greetings on this, the 33rd Anniversary of our Independence. Today, as a nation, we have reached yet another milestone in our journey of self -determination and nationhood. Today, we stand in unison, as a Federation reflecting on our strength, progress and achievement over the past 33 years. On this Independence Day, let us therefore continue to demonstrate in all our affairs the importance of self-reliance and self-determination. Thirty three years ago, most of the people of this country were possessed with a heightened level of excitement and anticipation, at the imminent transition from being a state in Association with Britain, to accepting the instruments and symbols of becoming an Independent Nation of taking full responsibility for all of our affairs, with our own Constitution and laws to guide the future operations of our people and our flags and other symbols of our independence – the Federal Parliament and a Nevis Island Assembly and specified authority for Nevis. It was a momentous occasion, replete with nostalgia as we had enjoyed the protection and privileges of being citizens of the British Empire but also, with the great expectation of being citizens of a new nation, to soar and grow like the young eagle as it is set free from the nest of its mother, to find its way in the world, to face the challenges and to chart a course through the turbulent waters of international politics and provide a viable and a better way of life for its people. This year’s Independence theme of “Promoting prosperity through sustainability and national unity,” is both timely and insightful. It implies that our development and prosperity must not be achieved and treated recklessly but in a responsible and sustainable manner. We therefore, should meet the needs of the present without comprising the ability of future generations to meet their own needs. National Unity is a process not a destination or an end product. It is a process of unification and national identity regardless of belief, culture or politics. As a people, we may disagree on certain issues, however, we can have a shared vision and work unitedly towards a common goal and a common destiny. We should be the embodiment of “unity in diversity”. We should live in harmony though we are diverse. As we celebrate our 33rd Anniversary of nationhood, let us focus our attention on uniting as one people with love of God, love of country and each other. Let us embrace and care for each other and unite with those whom we have differences, grievances and disagreements. Let us discard the impulse of individualism and uplift the collective national interest. Let us move from a condition of isolation and self-consumption to a broader nationality identity. As a nation and as a people, we must take our destiny in our hands and build a St. Kitts and Nevis of our dreams. We must demonstrate the will to create a future which will empower all of our citizens. No member of our society should be left behind – neither the poor, the aged, the uneducated or the young. Now is the time for us to join hands to cooperate, integrate and reinvigorate our bonds of friendships. Our 33rd Independence Anniversary, presents us with an extraordinary opportunity to carve out a common destiny and march towards prosperity for all. We have come a long way, over those 33 years and we must congratulate and give due recognition to all who were instrumental in creating the environment, designing and reshaping the vision over the years from colonial times to the present. In this regard, we must pay tribute to our National Heroes – The Right Excellent Sir Robert Bradshaw, the Hon. Paul Southwell, the Hon Joseph N. France, Dr. Simeon Daniel, 1st Premier of Nevis and Sir Kennedy Simmonds, first Prime Minister of St. Kitts and Nevis and all who toiled with them, to create the path for our Independence. As we reflect on the accomplishments which we have made as a people, it is our responsibility to even now, continue the vision and dreams of our founding fathers and leaders, to ensure that we do nothing to squander the gains and the excellent achievements which have been made. As a small country, the smallest independent nation in the Western Hemisphere faced with all the challenges of a hostile global environment, financial regulations which threaten to cripple our Financial Sector and the threat of closure of our correspondent banking, in some instances unfair competition in trade and even the dumping of goods in our region, these are things which we must be aware of. The serious competition which our country faces for tourist arrivals and the competition for our pioneering effort in the Citizenship by Investment Programme (CBID), have to be real concerns for us as a people; the myriad challenges to provide adequate health services to maintain a healthy nation and reduce the debilitating communicable diseases which threaten the existence of our human and financial resources [and] the challenge which we face from competitors for employment under the Caribbean Single Market & Economy (CSME) in the region and the free movement of people, means you have to prepare yourselves to deal with these challenges. My fellow Citizens, the world of 1983, comparatively speaking, seems like light years away. The obvious improvement in housing, sanitation and health services, infrastructure and so on, have been phenomenal. The standard of living among our people, is significantly higher but we have to ensure that the quality of life – employment earnings, the eradication of poverty and eradication of Non- Communicable Diseases (NCD) are priority for and among all of our people. I have a great belief in our innate inherent capacity of our people, in confronting our challenges. We have always confronted them with courage, faith and resolve. Our resourcefulness and resilience have always been seen as important and have always seen us through. May we never lose hope in the future as citizens of a proud nation where opportunities abound. As we celebrate our independence, let us continue to demonstrate in our daily affairs, the importance of self-reliance and self-determination. Let us remain faithful to the pursuits of excellence in every area of our lives. Let us respect each other without hesitation or misgiving. Let us celebrate the success of our nation and our people, the success of our students, public servants and hardworking families. Let us honour our unsung heroes, our teachers, nurses, our armed forces, who have played a pivotal role in our nation’s progress and prosperity and in keeping our country safe and secure. Fellow citizens, though we have much to celebrate, we must not become complacent. We must continue to grow and pursue a national agenda of integration and prosperity for all. We must endeavour to marginalize all disquieting forces of divisiveness and intolerance. In so doing, our remarkable growth story of prosperity will be uninterrupted. Last of all, I exhort you to use you considerable intellect and resourcefulness to guard, preserve and protect the instruments and institutions of our Independence. The constitution and the laws of our country must be paramount and must be accorded the greatest respect by all of us. We must respect our Independence. As we celebrate the 33rd Anniversary of the Independence of our beloved country of St. Kitts and Nevis, let us pledge to keep our country safe and secure using our individual and collective abilities, to preserve the gains we have made and to project a future of prosperity and security through sustainability and national unity. Fellow Citizens, Happy Independence and may God continue to bless us all and grant us wisdom and courage to continue to prosper in unity. God bless you.